Offering much more than the basic functionality of the past, bathrooms today are designed with beauty and relaxation in mind. Corian® Quartz is a vital component in many beautiful bathroom designs. It is designed to blend with other bath materials, including: glass, wood, tile, stone, metal, and, of course, Corian® Solid Surfaces. Corian® Quartz surface suits any bathroom design and can be custom-cut to your exact specifications, giving you a rich range of edge and installation options. Perfectly engineered to give you a timeless natural look of pure quartz crystal. 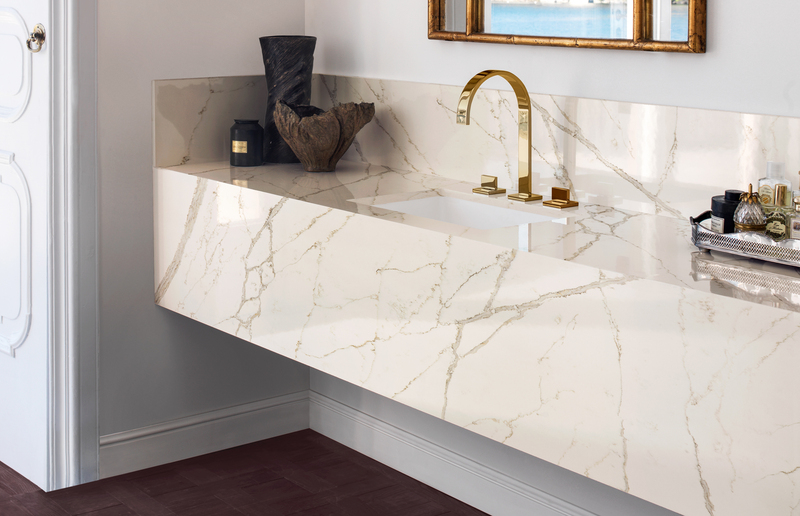 Corian® Solid Surfaces sinks can be perfectly integrated with your Corian® Quartz vanity top to create the sleek impression of a single flowing surface. With seamlessly streamlined features, there are no visible joints or cracks to collect dirt and moisture. Corian® Quartz is easy-to-clean and nonporous, so stains do not penetrate the surface. With proper cleaning, Corian® Quartz also resists the growth of mold, mildew and bacteria.